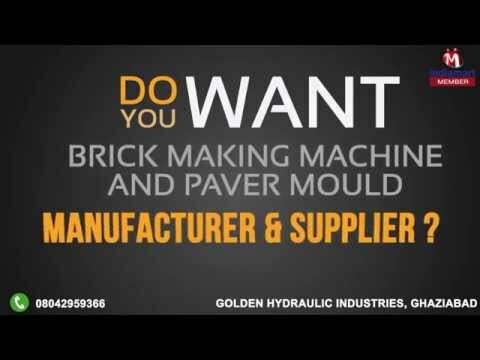 Golden Hydraulic Industries is engaged in manufacturing and supplying a range of Brick Making Machines and Paver Moulds. Our range of products includes Brick Making Machine, Plastic Paver Mould and Plastic Chequered Mould, among others. Our machinery is widely demanded for making bricks, pavers and mixing hard wearing material in various industries. Our products, renowned for their high efficiency and easy maintenance, are in accordance with industry-set guidelines. This has helped us earn the trust of clients. We are constantly upgrading our machinery to ensure a steadfast production rate. Each of our units, namely manufacturing, quality testing, warehousing, sales and marketing and R&D, work in cohesion while under the supervision of reputed managers. Moreover, we have established a wide distribution channel that enables us to carry forward timely delivery of consignments.